North Central Texas still being visited by hummers. This male ruby throat hovered just long enough in front of a purple hanging basket in our garden to get focused and shoot. Used and Olympus E-30 and 50-200mm lens with 1.4. Thank you for photography tip! Thanks for your remarks. I use an add on flash, sync speed of 1/250th sec. Manual camera and manual flash setting. Do a test shot or two to get exposure and then try to keep the same distance between camera and your subject ; use small aperture for depth of field. Usually a higher ISO speed so flash can recycle quickly. Wait for the birds to hover back from the feeder perch, or flower. Anticipate, pre-focus on flower or feeder perch. Take lots of images, have patience! Good Luck. 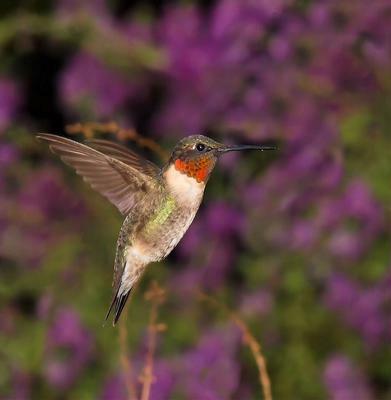 that is a beautiful photo of the ruby red throat male! That's a great photo. Sometimes our little friends do cooperate.